Liebe Urte und lieber Ralf, ich hab mal wieder etwas genauer auf euerer Seite geschmökert. 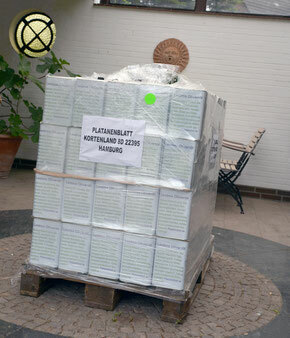 Heisst das, dass die Kanister recycelt werden können, heißt das, ihr nehmt die zurück? oder nur als Hinweis für den Container zum Metall abgeben? With havin so much content do you ever run into any issues of plagorism or copyright violation? My blog has a lot of exclusive content I've either created myself or outsourced but it seems a lot of it is popping it up all over the internet without my permission. Do you know any techniques to help protect against content from being stolen? I'd really appreciate it. Hi there! This blog post couldn't be written much better! Looking through this post reminds me of my previous roommate! He continually kept talking about this. I will send this post to him. Pretty sure he'll have a very good read. Many thanks for sharing! I don't even know the way I finished up right here, however I thought this publish was good. I do not recognize who you might be however certainly you are going to a famous blogger when you aren't already. Cheers!